I usually fall in love with magazine editorials at the moment I see them, but after a while I simply forget about them. However, there are only a few that I absolutely adore since their release. I remember the day I saw this cover of Elle magazine in a hot July day in Istanbul. I still remember the excitement I felt that day to immediately go home and dig into the magazine. Scarlett Johansson is a dream. She is pure beauty if you ask me. Some people may disagree, but I think she has this amazing sexiness you can’t find in most beautiful women. In 2004, “Lost in Translation” had just come out. It was a big hit. She was very beautiful. She was everywhere. She was the “Scarlett”. “Wanna be with you Scarlett” for men, “wanna be just like you Scarlett” for women. This is 2011. And Scarlett is still the same. She amazed us in “The Prestige” (2006) and we simply adored her in “Vicky Cristina Barcelona” (2008). I don’t even have to talk about “Match Point“, right?! Now she has an upcoming movie “The Avengers” in 2012, which she is going to perform with actors like Mark Ruffalo, Gwyneth Paltrow, Chris Evans and Robert Downey Jr.
No matter what Scarlett will always be in my heart with her Elle photo shoot in July, 2004. Elle Turkey, Elle Spain, Elle South Africa and some other more had also chosen Scarlett for their covers in July, 2004. Look at these photos now, and then keep your silence for eternity. Let the girl do the talking. Elle dergisinin 2004 yazi, Temmuz sayisi. Elle Guney Afrika, Elle Turkiye, Elle Ispanya ve daha bircok ulke icin secilmis olan kapak kizi: Scarlett Johansson. Scarlett o gunlerde henuz yeni cikmis ve sinema dunyasina bomba gibi dusmus olan “Lost in Translation” filminin masum, seksi ve akilli aktrisi, ve moda dunyasinin yeni goz bebegiydi. Bu Elle cekimi de, benim ve benim gibi bircok insan icin, gelmis gecmis en basarili dergi cekimlerinden biri. Her kiyafet, her taki, her poz, her renk birbirinden guzel. 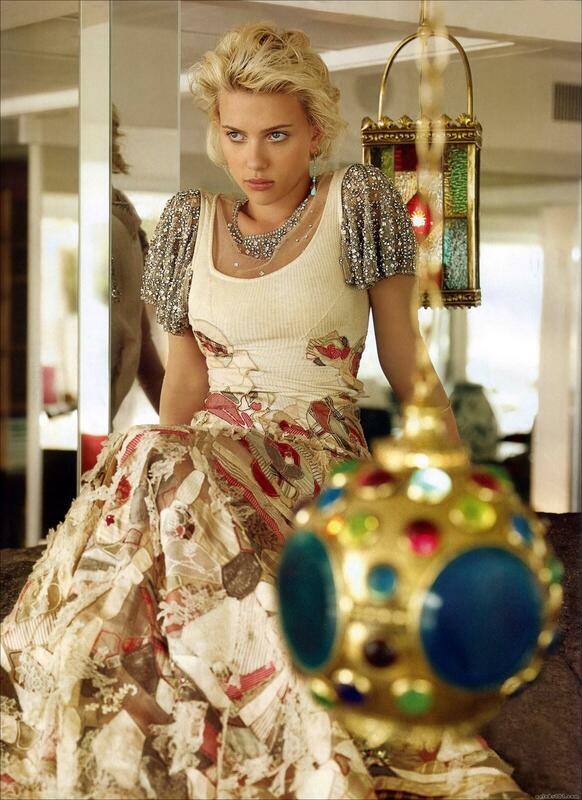 En onemlisi, her resimde Scarlett daha da guzel. Fotograflarin her karesini ezberlemis olmama ragmen hala bakmaya doyamiyorum. Sizlerle de bu cekimi paylasmak ve sonra sonra bu konu hakkinda ebediyen sessiz kalmak istiyorum. Birakalim resimler konussun. Roberto Cavalli dress, Louis Vuitton turquoise watch, Ilias Lalaounis turquoise ring. Roberto Cavalli elbise, Louis Vuitton turkuaz saat ve Ilias Lalaounis turkuaz yuzuk. Her yellow dress is Nina Ricci, turquoise bracelets are Stephen Dweck and her golden necklace is Debbie Fisher. Sari elbise Nina Ricci, turkuaz bilezikler Stephen Dweck ve altin kolye Debbie Fisher. Silk dress, Dior by John Galliano. Turquoise and silver necklace Stephen Dweck. Elbise Dior by John Galliano, turkuaz ve gumus kolye Stephen Dweck. Satin silk dress is Valentino. Bra, Victoria’s secret. Turquoise necklace Aurora Lopez-Mejia. Turquoise ring, Mouawad. Elbise Valentino. Sutyen Victoria’s Secret. Turkuaz kolye Aurora Lopez-Meija ve turkuaz yuzuk Mouawad. Alexander McQueen dress, Bonnie Maller turquoise earrings. Alexander McQueen elbise ve Bonni Maller turkuaz kupeler. Green silk and cotton dress Zac Posen. Cream silk slip Rossella Tarabini for Anna Molinari. Turquoise necklaces Debbie Fisher. Elbise Zac Posen, krem rengi bustiyer Rossella Tarabini for Anna Molinari, turkuaz kolyeler Debbie Fisher. Elbise, Rebecca Taylor. Kasmir hirka, Inhabit. Turkuaz ve altin kolye, Stephen Dweck. If you are also in love with Stephen Dweck’s jewellery in these pics, click here to see more details about the brand.